Through his writings and speeches, Alfie Kohn has been stirring up controversy for years, demonstrating how the conventional wisdom about education often isn’t supported by the available research, and illuminating the gaps between our long-term goals for students and what actually goes on in schools. 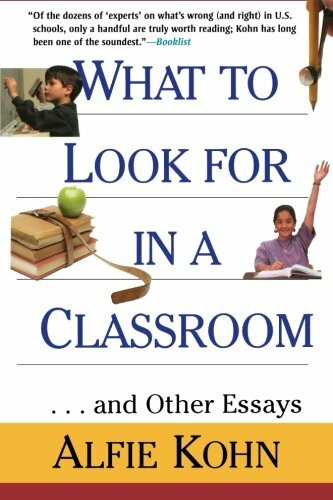 Now, What to Look for in a Classroom brings together his most popular articles from Educational Leadership, Phi Delta Kappan, and Education Week – and also from the Atlantic Monthly, the Boston Globe, and other publications. From self-esteem to school uniforms, from grade inflation to character education, Kohn raises a series of provocative questions about the status quo in this collection of incisive essays. He challenges us to reconsider some of our most basic assumptions about children and education. Can good values really be “instilled” in students? What, if anything, lies behind the label of attention-deficit disorder? Are there good data to support our skepticism about watching TV? Might such allegedly enlightened practices as “authentic assessment,” “logical consequences,” and “Total Quality education” turn out to be detrimental? Whether he is explaining why cooperative learning can be so threatening or why detracking is so fiercely opposed, Kohn offers a fresh, informed, and frequently disconcerting perspective on the major issues in education. In the end, his critical examination of current practice is complemented by a vision of what schooling ought to be. Kohn argues for giving children more opportunity to participate in their own schooling, for transforming classrooms into caring communities, and for providing the kind of education that taps and nourishes children’s curiosity. Through all these essays, Kohn calls us back to our own ideals, showing us how we can be more effective at helping students to become good learners and good people.